Hi, my name is Karol, I'm a professional guitar player, friendly and extremely patient teacher. I studied jazz guitar, played and recorded with many artists. I have over 10 years teaching experience (references on demand), I can help you with learning your favorite songs, but also I can introduce you to music reading, harmony, scales or digital recording, audio editing etc. I am a member of Registry of Guitar Tutors (RGT) and I can help you prepare for all the grades exams. CRB checked. I have been teaching guitar for over 2 years in London (private lessons and courses), I work with ‘Stars & Catz’, ‘Music Tutors 4 You’ agencies, two days a wee I teach also in ‘Fortress Music Studios’ (Shoreditch, Old Street area). I am a member of Registry of Guitar Tutors, CRB checked. 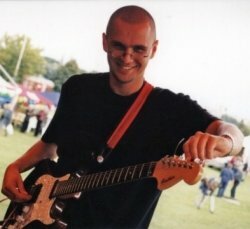 Before I came to London I was teaching guitar for 9 years in Warsaw, Poland (I have taught over 50 students of which many over a period of 2-3 years). Prior to that, I was a session guitarist for a few years. Previously I studied music at Academy of Jazz and Contemporary Music in Krakow, faculty of Jazz Guitar. I teach electric, acoustic and classical guitar in different styles; pop, rock, blues, jazz, funky, soul etc. I am a member of Registry of Guitar Tutors (RGT) and I can help you prepare for all the grades exams.